Luxury resorts and spa hotels, luxury resorts, leading resorts, spa hotels in Greece offer high quality services, comparable to leading luxury resorts and spa hotels worldwide. Luxury resorts in Greece offer an extraordinary experience – where an appointment becomes an escape and a visit becomes a tradition. Most of them are ideal couple or family getaways located mostly on pristine, white-sand beaches caressed by crystal-clear seas. 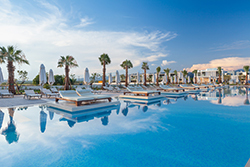 Luxury resorts and spa hotels across Greece - Athens, Crete, Rhodes, Chalkidiki, Mykonos, Santorini, Cyclades, Ionian Islands, Kefalonia, Zakynthos, North Aegean Islands, Dodecannese Islands, Peloponnese, Crete – boast world-class amenities and high quality of personal service, as well as exceptional facilities, cuisine, spa, activities and excursions. Guests can enjoy the finest Mediterranean and international cuisine, dive into a paradise of sports and activities or indulge in total privacy. Accommodation is varied by always luxurious, with a wide range of different types available to suit each guest, including spectacular sea views, private gyms, spa, landscaped grounds, Olympic-size swimming pools and home cinemas. Give mind and soul total relaxation and a break from the daily routine with a spa holiday. The unique luxury spa resorts across Greece - Athens, Crete, Rhodes, Chalkidiki, Mykonos, Santorini, Cyclades, Ionian Islands, Kefalonia, Zakynthos, North Aegean Islands, Dodecannese Islands, Peloponnese, Crete - feature superb spas that blend effortlessly with Greece's most idyllic beach settings and local charm. A choice of spas and specialist health resorts that are among the world's best, provide the ultimate in rest and rejuvenation. A true ticket to relaxation, the spa treatments feature various spa packages for superior pampering and encompass a wide variety of indulgent delights designed to help you look and feel your best. The luxury spa resorts in Greece also offer a wide variety of recreational activities such as golf, tennis, horseback riding, skiing, and water sports along with renewing spa experiences.